Octopus Diver is a 5 star PADI center and it was voted one of the world's top 100 scuba diving clubs by German magazine "Unterwasser". RATES: the cost of one dive with the equipment provided is 55€/person and 45€ without, then we have some packages of 5 and 10 dives (5 dives or more: 10% of discount) and NITROX is available at an additional 5€. When you dive with Octopus Diver you give 1% (already included in our price list) for a coral reef restoration project, we are member of Longitude 181 Nature. (www.longitude181.org). About the schedules, we organize the dives three times a day, the first meeting time is 9am at the base for a single or a double tank trip and 2pm for the second dive in the afternoon. For intro dives and check dives, we meet at 10:45am except on Sunday. We organize a night dive every Wednesday night with a meeting at 6pm and a double tank dive on Sunday morning. Behod the club's commitment to provide you with hight standards of service and security, Octopus Diver is also a unique place for its warmth and friendliness, a gathering point for scuba divers worldwide. Open every day from 09:00 tò 17:00. Certified divers or beginners,1-2 dives daily. Praslin Prodivers is located at L'Archipel Hotel directly on the beach of Anse Gouvernement, Praslin.The dive centre was founded with the goal of providing an unforgettable, personalized diving experience with extraordinary standard of service and most importantly safe. We are as well a member of the Scubapro Educational Association (SEA). 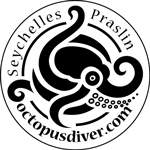 We look forward to welcome you for a dive on Praslin at Praslin Pro Divers. Every day. Biginner or experienced diver. Open from 09:00 to 17:00.
delighted to make you discover the great diversity of our underwater life. year round by a smile and professionally taken care of. - All diving federations accepted.